and new Jeep Kicker Rock Sliders! 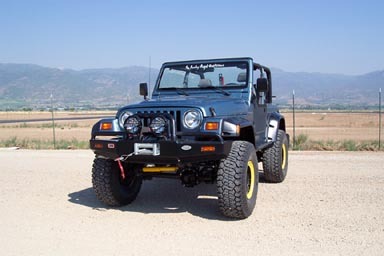 We are currently looking for 2dr and 4dr JL Wranglers for design and installation of rock sliders within Northern Utah. If you are close to our location and would like a free kit, installed, please contact us by email for details. Everyone thinks their kit is "the best". What we believe puts Rocky Road Sliders above the rest is our triangulated mounting system, and how tight and high up our sliders sit. Triangulated mounting means the mounts are not just attached to the frame, but the frame and the body. By using the pinchy seam on most of our slider designs, we give MUCH MORE mounting strength than any other kit possibly can only attached to the frame. They can use all the fancy frame wraps and gussets they want, but NOTHING BEATS TRIANGULATION! And no 'chat room' expert can deny this engineering fact. Our kits address the miniscule amount of frame/body flex as well, so this is NOT an issue with Rocky Road slider kits. 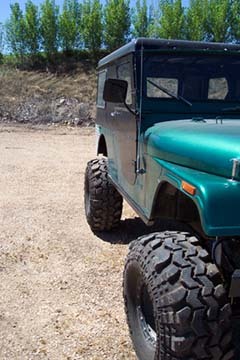 Side view of YJ Rockrails. 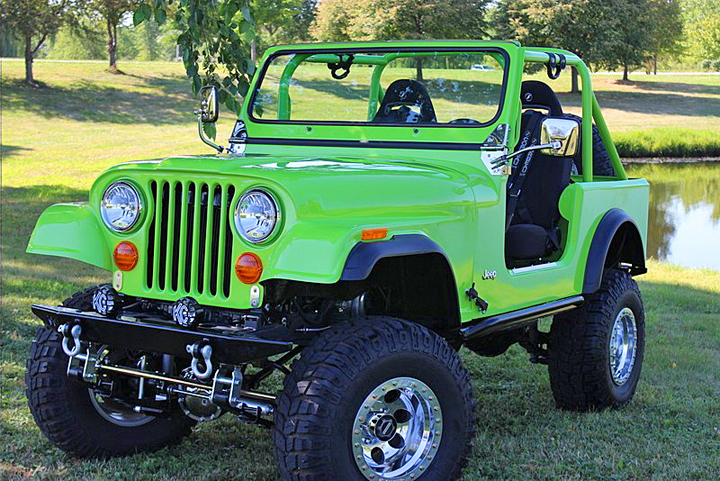 Shot of our CJ 6 Rockrails. We use tubing 3/16" thick. As an undeniable fact, NOTHING on the market is stronger than our Jeep Rock Sliders. 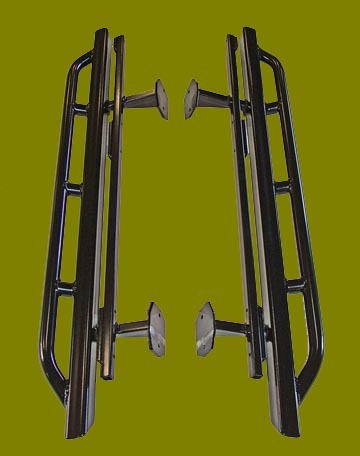 Many other rocker bars are made from thin 1/8" wall material. With the width of our hitch grade tubing, the thickness of the 3/16" steel, nothing on the planet is beefier. We're so confident you could NEVER even hurt our Rockrails, that we offer a lifetime guarantee. If you can bend or dent one, we'll replace it. Go ahead and try all you want, Rocky Road Rockrails are undamageable. 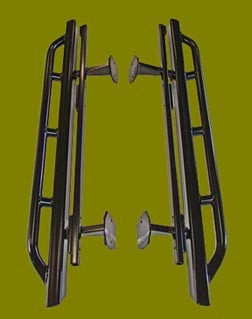 Key to the overall strength of our rocker bars (beyond the super thick tubing) is the mounting system. Most rockers are just reshaped angle steel which only bolt to the body. These look good pictured on a website, or maybe parked in a parking lot. Take a sledgehammer and whack it though, it will dent in... ours will not. So which is stronger on the trail. Are you going for the prettiest SHOW-Jeep? Or the Jeep with the best protection for trail hazards??? Our rockers not only protect the corner area of your Jeep, but also stand out from the side to offer a good buffer zone to keep your body off the rocks. 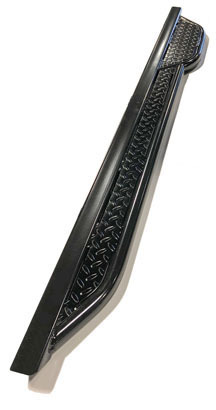 Rocky Road Rockrails are very simple to install and are completely 'bolt on'. In fact, the entire Rockrail can hang itself in place with the simple help of one small C-clamp to the frame. Nothing is easier! Our design distributes the load across a broad area instead of focusing it on small spots. 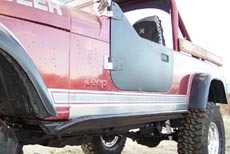 TJ Wrangler flares use existing holes in the body for mounting, no body drilling required. You'll find Rocky Road Rockrails very attractive and blend in nicely with your stock flares and moldings. They run fender to fender and many folks have commented on their very OEM (factory) look. In a nutshell, our Rockrails are the strongest and thickest bars on the market, best mounting system, and are guaranteed NEVER to bend. Why wouldn't you get a set? 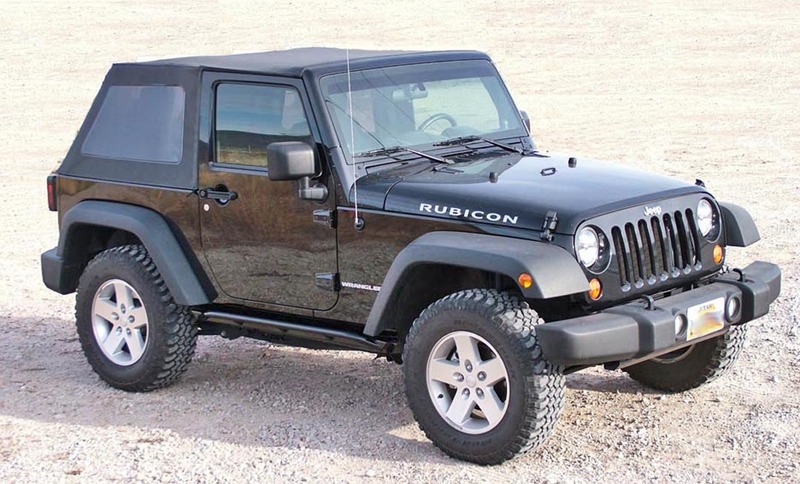 Our Rockrails will work on all Rubicon models! Super Sliders mounted to a CJ 5. She's a bit rusty, but our Rockrails are dressing her up big time! Super Sliders mounted up on a CJ8 (Scrambler) . Super Sliders on our company TJ Wrangler. 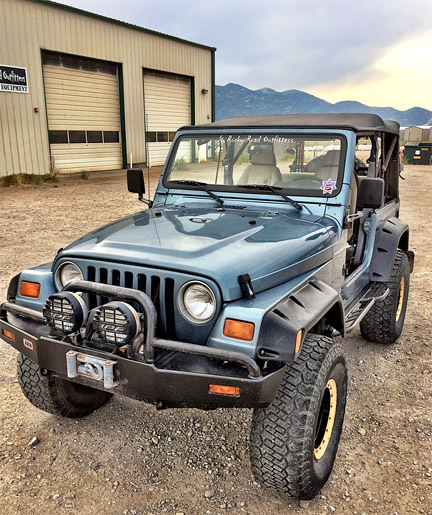 Joe Belinsky's beautiful 78 CJ with Supersliders mounted up.. These rock slider bars offer all the strength and warranty of our regular Rockrails, but with the added bonus of an additional upper tube. This upper tube can provide even more protection against sliding into rocks, trees, or other trail hazards. please click the pics for larger views. Not to mention increased side protection for your Jeep when it comes to side impact collisions for passenger safety. And if some chump happens to swing his car or truck door into your Jeep in a parking lot, it ain't gonna be you that's screaming when his door is all dented up from smacking your Superslider side protection bars. That's right... protection doesn't just have to be for the trail. Everyone who has seen these on our shop 4x4s has wanted a pair. 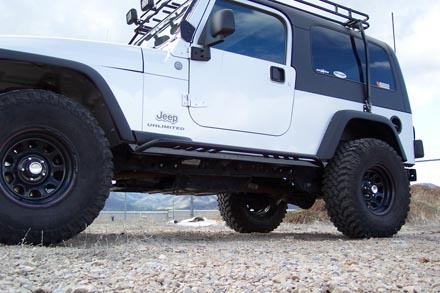 They are by far our most popular style of rock sliders. Supersliders are unequaled in strength and looks. If you don't see a picture for your vehicle, the shots on the right will give you a great idea of how our kits look no matter what Jeep, as they all have the same awesome 'look' about them. The Superslider kits also make an excellent step for access to roof racks, helping put on your softop or bikini top, maintenance from above, and such. This is basically the same proven design and engineering as our world famous Rockrails, only with the extra slider tube up top for additional protection, coverage, and looks. 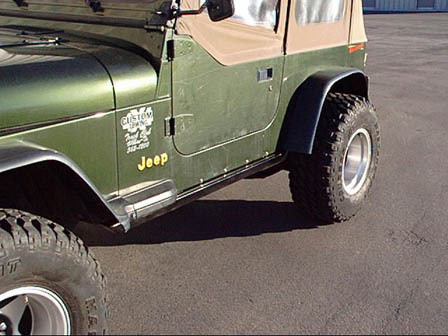 We don't have pictures of the Super-sliders for all Jeeps at this time (unlimited is shown above), but the basic look is the same for all so check out the pics to the right for a good idea on this awesome design. Jeep Wrangler Kicker Rock Slider kits! Click the picture for a closer view, and different perspective. Also the best working rock slider for use with a HiLift jack, on the market! Forget those 'folded or bent' style rocker cover-ups out of thin 1/8" steel... they make for a good show, but if you want true protection... nothing keeps trail hazards and damage away like the Rocky Road Supersliders. Super Sliders kit on Chris Sayre's Rubicon JK. Chris is our head engineer and chief perfectionist. 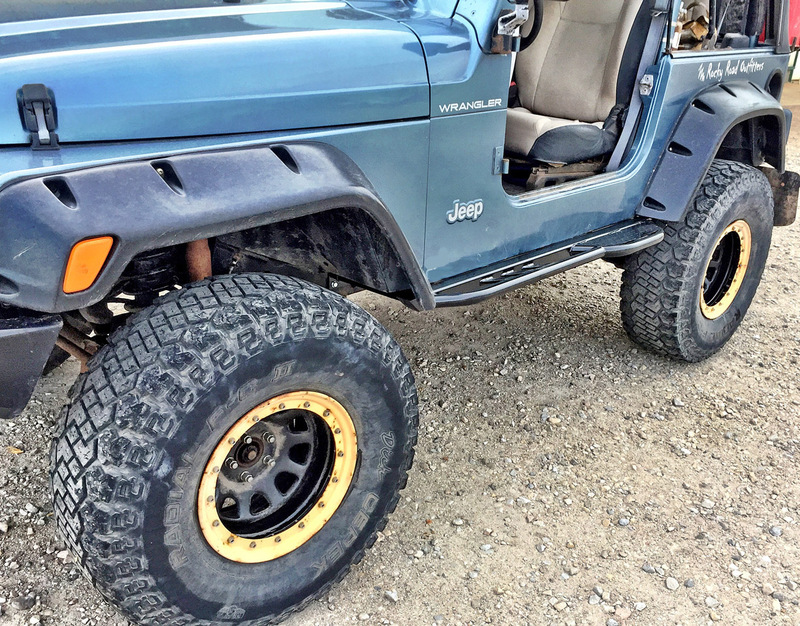 Nothing looks better on his Jeep, or will on yours than Rocky Road Supersliders.